A true story that few ever believed would come to light, GROWING UP BIN LADEN uncovers startling revelations and hidden secrets carefully guarded by the most wanted terrorist of our lifetime, Osama bin Laden. "I was not always the wife of Osama bin Laden. Once I was an innocent child dreaming little girl dreams..."
Since September 11, 2001, journalists have struggled to uncover carefully guarded information about Osama's private life. Until now, Osama Bin Laden's family members have not cooperated with any writers or journalists. Now, with unprecedented access and insight, Jean Sasson, author of the bestselling Princess: A True Story Behind the Veil in Saudi Arabia, takes us inside the secret world of Osama bin Laden. If you ever had any curiosty about the psychological health of Osama Bin Ladin then read this book. 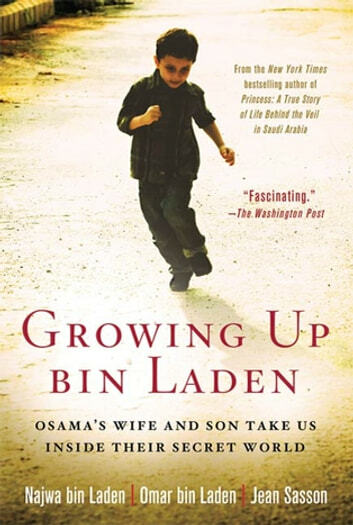 With some editorial support from Jean Sasson, this book is well written by his fourth son and first wife They remove any doubts that Osama was obsessed with his religion to the point that he wanted to control the world and completely destroy the western world. This book enlightens the reader about the Saudi Arabian history and its leaders. Then it acquaints the reader about the very wealthy and powerful Bin Ladin family. The book is a page turner as it uncovers the controlling reality of Osama's power over his family and followers. After reading it, I have a much better sense of who this mysterious mad man was and the terrorizing impact he had on so many lives. Make sure you reserve a block of time to read this book without interruptions. HoB.